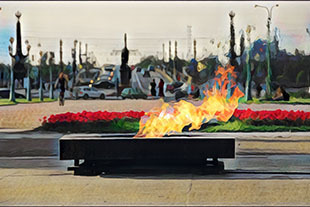 Significance: This is the first eternal fire in the Soviet Union. All other eternal fires across the country were lighted from this fire. Interesting facts: This eternal fire burns above the graves of the victims of two revolutions: The Russian Revolution of 1917 and The Great Patriotic War. It is interesting that now this cemetery is a favorite place for sunbathing during the day and for warming up at the Eternal Flame at night.